I awaited the Barclays Cycle Hire scheme with interest. I live within the covered zone (approximately zone 1 + a bit) and make around 2-3 return trips a week by bus on routes that I could cycle. I’d also been considering cycling for a while, but wasn’t sure if I’d like it (or even if I still could) and I don’t own a bike. In other words; I’m definitely part of the target audience for the scheme. When registration day came around, I duly registered (with a glitch or two) and was sent my membership key in advance of the bike release day. My first trial wasn’t good – I attempted to give one a quick go around Russell Square from the rack just outside my office, but instead got an amber light and horrible juddering noise. Instead I had to walk to the next rack along, on Bedford Way, where I took my first 8 minute ride. I can confirm and corroborate the general opinions on the bikes. Yes, they are quite heavy, but not overly so. The gear range is terrible. I’m not a strong cyclist, or fit in any way, but even uphill only the highest gear was of any use. First or second just leave you pedalling like a maniac without actually moving. And if your bag is too small, it will just fall sideways out of the basket, unless it is large enough to be bungee’d in. The real test came on Saturday, when I took one to and from work (having invested in a helmet and reflective backpack cover). Other than highlighting how unfit I am – panting and sweating after a 15min cycle, it was totally fine. I even cycled home at 2am in the morning and found the lights to be adequate and the experience perfect. The scheme was actually perfect, as there is little in the way of public transport from Goodge Street to Farringdon/Sadler’s Wells, but there were docking stations almost door-to-door. Spot on! Monday night, I got even braver and tried Russell Square to Victoria during the rushhour, and took advantage of being able to dock the bike and forget about it; using it to cycle to the pub, have a few drinks and get the bus back, not worrying about leaving my own bike somewhere overnight. I’ve now used the bikes to make seven journeys that I would normally make by bus or tube, and it has been both fun and useful each time. Only once have I been over the 30 minute limit (by 34 seconds), so I’ve saved at least £6. 15 more weeks until I’ve paid off the £45 annual membership and the cost of the helmet and backpack cover! The only scary moment I’ve had was cycling down Oxford Street. So many buses, bus stops and rickshaws that all seem to be out to get you. I shan’t be making that mistake again any time soon. The other thing that is quite strange about cycling around London is my propensity to get lost. I know my way around places that are walking distance from home and work, and I know the buses and tube for places further away, but actually having to cycle to places I’d normally take public transport too was surprisingly difficult. It isn’t like being on foot, when you can just stop any time, or turn around and because you are moving faster, there is less time for contemplating the route. It is funny though, because I don’t have that feeling in the car. (Probably to do with the sat-nav…). Any way, so far I have loved the scheme and I hope I continue to use it beyond its current novelty. 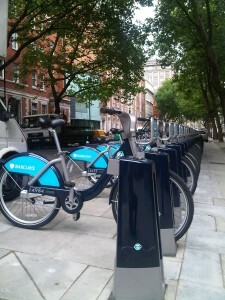 This entry was posted in Comment, Cycling and tagged cycle hire, cycling, london by jstreetley. Bookmark the permalink. Super blog post James. I’m loving the new bikes too and seems plenty of others are too. Would you mind sharing you post over on the Boris Bikes forums? Not all all, in fact I’ve just registered on your forum in order to talk about the “tight rear brake” issue. I work for an independent film production company who are making some short documentary films about people whose lives have been changed positively by using Boris Bikes. Perhaps you would be interested in telling us some stories?